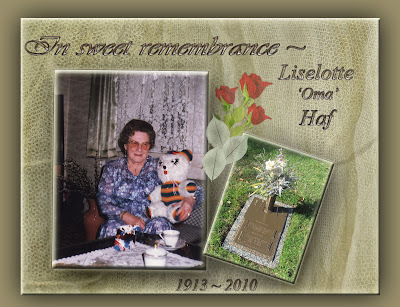 Two year's ago today, my maternal grandmother, Liselotte 'Oma' Haf, passed away peacefully in her assisted living home, in Augsburg, Germany. Rest in peace . . . Schalf Gut . . . Schlaf in himmlischer Ruh . . . we miss and love you very much, Oma. I wish I had known your Oma. You paint such a wonderful picture of her. Thank you , Wendy . . . she was a wonderful grandmother! You would have loved her. I need to contact you about your Beals and compare information. Our Beals came from Germany. We are trying to get more information into Germany.